- Accumulate at least $24K a year. Stretched target - $50K. – Partially complete. Accumulated approximately $ 38K. - Portfolio should be able to generate $8,000 a year after taxes in the money of the day. – Complete. Without seeing end of the year result from some of the companies received $8 K after taxes. - Develop additional income source in full, potential reward about $2,000 a year – Not achieved, although some measurable progress made. - Less than 5% of portfolio in cash by end of the year and $350 K overall net worth in the money of the day – Partially achieved, portfolio $387 K but approximately 11% in cash. - Regular monthly updates – Not achieved. (Missed September update). - To cover 6 themes on financial independence - Portfolio performance, Assets Allocation, Energy stocks screening and Family budget. Missing one more theme. 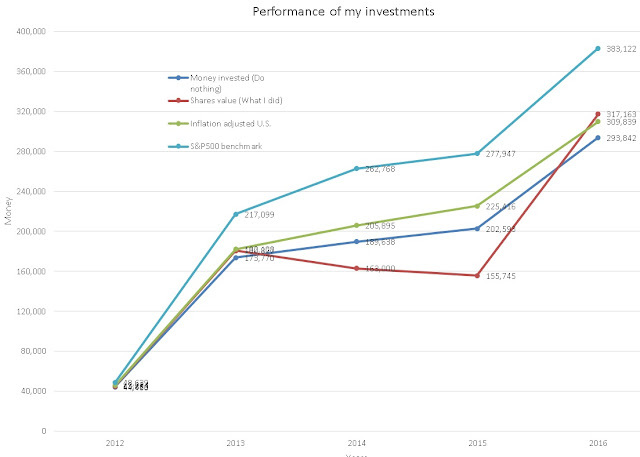 - Publish easy tracker for the long-term portfolio performance – Not achieved. - Create list of books to read - 12 books are minimum. Not achieved. Read only two, not achieved. - Publish the books reviews – Not achieved. - Stay under $100,000 with the family expenses – Achieved. Spent $84K. - Accumulate $7,000 towards durable goods replacement over 10 years – Achieved. Be happy. Run 1,000 miles during the year. Keep BMI below, target 26.6 (current 27.5)- Partially complete. Ran 1,022 miles but BMI is 27.4. Emerging markets (mainly Russia) rebond and energy sector. Minimum target was $24K, stretched $50K. Partial completion. In other words, if in 2010 you would have $ 10,000 and keep it, it worth $7,930 today. Note: Both Gazprom & Rosneft dividends are already tax deducted. The companies although benefited from Trump effect and expectation that next year will increase share of net profits directed to dividends (currently ~27%, expected to go up to 50%). If we discount this three factors Gazprom return is 4.8% and Rosneft 3.2%. What does my financial independence portfolio performance tell me? - If you are aiming for a longer term towards retirement, growth type of a portfolio – you better stick with S&P500 index. Yes, I beat it in 2016 but still way off over the course of 5 years. Dividends wise I received 3% vs. 1,8% from S&p500. - My portfolio still overweight with cash (roughly ~15%), with emergency money. - I need to stay away from EU indexes and funds – nominally they are raising, but as the West European currencies fall net results is zero or negative. British FTSE 100 went up by 14.2% in 2016 , while GBP lost 17% to USD. Net result? -2.8%. German DAX went up by 6% in 2016 (including dividends reinvestment), but EUR lost 5% to USD in the same period. In overall the year was fair – I achieved my short term financial goals (savings, performance, expenses) but not making progress on the long term – reading books, reducing weight and making additional income streams. This is even more important now, when my ability to do savings from reduced salary is not there.